A hot shower, even where there is no electricity: low-income families in Argentina build their own solar water heaters using recycled materials. A non-profit organization hosts the workshops, gathers helpers and shows participants how to utilize renewable energy. Often the most sustainable solution is also the most economic and the most simple. Wherever need is great, innovation becomes imperative. This is the case with the showers made from recycled materials, and complete with water heaters, that an NGO builds to improve precarious housing in the suburbs of Buenos Aires. 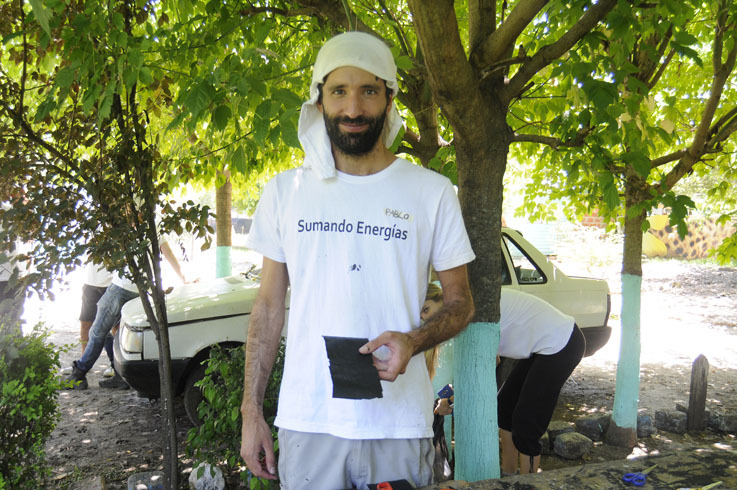 Every other weekend an NGO called Sumando Energías (“Combining Energies”) brings together 25 people for a workshop. They gather in the patio of a house in the semi-rural area of Garín, about 40 kilometers north of the city. The participants are there for a practical course in construction using recycled materials. The objective is to make, with 50 hands working for 2 days, a solar water heater that will allow a family with scarce resources to have hot water without gas or electricity. And, at the same time, the organization shares their knowledge of how to build a water heater that reuses discarded materials to capture the sun’s energy. The solar water heaters are made with plastic bottles stacked on top of each other and reinforced by layers of aluminum, Styrofoam, and TetraPak cartons. This is then mounted atop a structure made of wood and tarps that connects to a water tank and serves as an outdoor shower. All of these materials are provided by the family that will receive the shower, their neighbors, volunteers brought together by the NGO, and the course’s participants. The few industrial supplies required are purchased with the participants’ enrollment fee which allows them to retake the class as many times as they like. So a family receives a shower with an ecological water heater and 25 people have learned how to use recycled materials. They even serve as ambassadors, carrying their new knowledge out into the world. Pablo himself is an industrial engineer who was investigating sustainable construction methods. In his research, he stumbled upon a solar water heater designed by José Alano, a retired Brazilian mechanic who created the water heater out of plastic bottles and published the design on the internet, with an open patent. 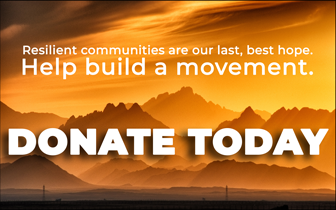 Pablo already had experience with socially-oriented construction through his volunteer work with the Techo Foundation, which builds housing for people in situations of extreme poverty. Together with some friends who were architects, they remixed Alano’s blueprints with Techo’s teamwork format and they came up with the prototype for the course which they dubbed Sumando Energías. After a few improvements to the water heater to adapt it for Argentinian winters, they were ready to launch the initiative. The first course—and the first heater constructed—was in September of 2014. They started out creating one shower per month, but right away the number of eager participants warranted more classes: in 2015 they built 17 water heaters and in 2016, 35. In total they boast 59 solar shower installations; 56 of them in Garín. They also built a solar water heater in conjunction with the Pindoty 1 Guaraní community of San Ignacio, in the Misiones province of Argentina. Another was built in Santa Victoria Este, Salta, Argentina, inside an ecological residence known as an “Earth Ship” (Nave Tierra), which functions as a training center for artisans. Another was built in Bahía Blanca through an initiative of the National Technological University (Universidad Tecnológica Nacional). In 2017, the organization plans to build another 50 solar-powered showers. The solar water heaters in Campo de Ruso, the shantytown in Garín without a natural gas connection, are known far and wide. It’s here in the shantytown that Sumando Energías, in just two and a half years, has improved the lives of 32 local families. Many more families are on the waiting list and in the meantime they help build showers for their neighbors. The class takes place within the shantytown, at the home of a local resident who offers the use of his large patio with good shade. The process has six phases, each one led by a coordinator—in general a volunteer who has previously completed the course—and about four participants. At one station they cut and stack the plastic bottles; at another they cut cans and TetraPak cartons; at another they paint them black to absorb the rays of sunlight. There are more technically oriented stations as well, to assemble the tank, taps, and pipes for the water heater. At the end of the day on Sunday, all the pieces are put together and the solar water heater is mounted atop the wooden structure that will serve as the shower. The recycled materials and volunteer manpower bring the cost of a new shower down to just 3500 pesos, one fourth the price of an industrial solar water heater.